The seven visionary founders of Alpha Phi Alpha Fraternity, Inc. established the first chapter at Cornell University in 1906. 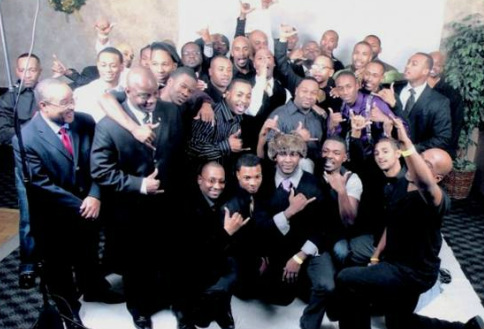 Eight years later, Pi Chapter, an undergraduate chapter, which grew out of the Cleveland College Club, composed of students attending Case Western Reserve University, was established in Cleveland Ohio and became the fifteenth chartered chapter of Alpha Phi Alpha Fraternity. Graduate (Alumni) brothers in the Cleveland area were affiliated with Pi Chapter until Delta Alpha Lambda Chapter was chartered November 15, 1947 to provide continuing leadership opportunities for Brothers beyond the college years. Brother Josephus Hicks was elected the first DAL President, Henry C. Crawford: Vice President, Harold Barnett: Secretary, Kweigger Aggrey: Treasurer, Jay B. Walker: Associate Sphinx Editor. Additionally, since its inception 29 other distinguished brothers served as Presidents to date. Some of the fifty Charter brothers involved in the very early years of our chapter include: Henry C. “Heinie” Crawford, Milus Graham, Joe Hall, Felix Haney, Frank “Doc” Kelker, Bob Madison, Joe Smith, Bert Styles, Carl Richards and Henry L. “Hank” Williams. Meetings were held at Dr. Christopher’s Funeral Home, the office of Edwin “Fly” Williams, Sr., the Redmond Building, Corky and Lenny’s, First Bank and the Cedar YMCA. They were also held at the Alpha House owned by the chapter on Magnolia Drive prior to the construction of the VA Hospital. Presently, the chapter meets at Cleveland State University. As in the past, meetings are held at 7:00 p.m. on the third Friday of each month, with the exception of the months of July and August. The Chapter always supports national and local programs and projects. National programs have included The Million Dollar Fund Drive, Project Alpha, Go-To-High School-Go-To-College and funding for the Martin Luther King Memorial. Local programs include: Founder’s Day Services followed by attending Sunday Church Services at churches where Alpha Brothers serve as pastors, Distribution of Holiday Food Baskets to Needy Families, The Sweetheart Brunch honoring Ladies of Alpha, a Scholarship Fund-Raiser, A Family Picnic and The Annual Elmer Collins Golf Outing are just a few of the community projects DAL sponsors. DAL has also received recognition for its’ opening on December 5, 1987, of the Alpha Phi Alpha Housing Estates by the national body. Community recognition from the Greater Cleveland area over the years have come from the NAACP (Golden Heritage and Distinguished Service plaque), the Urban League and the United Black Fund to include a few. Additionally in 2010, Delta Alpha Lambda received The Outstanding Chapter of the Year Award and The Charles H. Wesley Award from the Ohio District. Special thanks and acknowledgment to those who contributed to the keeping of the History of DAL: Brother Chellis D. Madison, Brother Milton Randall, and Brother Sidney S. Thompson and all of the members who contributed to the publishing of the 1994 edition of DAL history and the Millennium edition. This brief abridgment is extracted from the earlier editions.